Are Your Hormones Marching To A Toxic Beat? Hormones govern every natural function in your body. Natural fertility is no exception. I’m speaking equally to men and women, here. So that includes you, no matter which parts you have! The ill-effects of endocrine disrupters plague us all these days. We generally don’t realize the extent that our hormones are being messed with. Think about what our modern world and diet includes. Current/past prescriptions (ie birth control pill); plastic bottles; metal food cans; detergents; flame retardants; soy-based foods; cosmetics; and pesticides. We usually don’t even give a second thought on the effects of all of this. 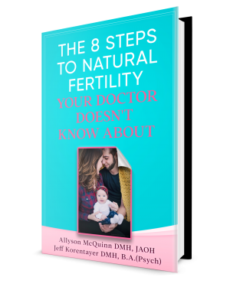 Studies show how much these elements are interfering with our natural fertility. Long-term, they are the cause of some cancers. Not to mention how they affect organ and neural systems in prenatal development. There’s even much evidence showing that hormone disruptors leave genetic imprints. We’ve often seen drug traces in a patient for things their parents had exposure to. They respond to our detox protocol exactly as if they had taken the drug themselves. This includes all prescription drugs, as well as environmental toxins. We had many “mystery” cases in our clinic before we understood this phenomenon. You’d be quite amazed at what crosses over the generational divide. Drugs, toxins, hormones, and even intense emotional states can pass down to you. All this to say that there’s more to pH balance than diet and lifestyle. It’s not only your own prescription history that counts, but your parents’ as well. Your hormonal system is like the intricate workings of a grandfather clock. In fact, your hormones may still be keeping time based on the drugs your grandfather took!